Praised by The Lancet, which called it a “lucid account that . 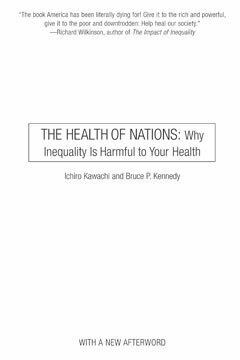 . . deserves to be read by everybody interested in the politics of health,” and the New England Journal of Medicine, The Health of Nations provides powerful evidence that growing inequality is undermining health, welfare, and community life in America. The book’s prizewinning authors also make an urgent argument for social justice as a necessary vehicle for the betterment of society. The Health of Nations is the synthesis of years of groundbreaking research on the connections between social structures and health and welfare, and one which Nobel Prize winner Amartya Sen says “has much to offer in reshaping the agenda of the debate on health care.” Now in a revised edition which includes a new afterword, it dramatically demonstrates that growing inequalities, far from being a benign by-product of capitalism, threaten the very freedoms that economic development is thought to bring about. Bruce P. Kennedy (d. 2008) was a social epidemiologist, formerly at the Harvard School of Public Health.